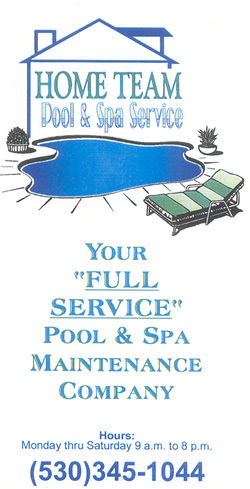 The Home Team Pool and Spa Service (formerly Sprenkel's Pool Service) has been serving Chico and Paradise residents for over nineteen years. We are committed to high quality customer service, expert technical assistance and positive service environment. At the Home Team we are dedicated to making your experience a pleasant one, and to providing you with the best quality supplies and service available in the pool and spa industry. Whatever your needs, rest-assured that the staff at the Home Team Pool and Spa Service are committed to you--OUR CUSTOMER! We spend 100% of our time giving you world class service! We are committed to providing such extraordinary service that you will gladly refer your friends, family and acquaintances to us. With your help, we are able to build strong, lifelong relationships... one person at a time! Basic Service Package $59/Month with Spa $70/mo. -Balance Chemicals Weekly; Maintenance performed on Same Day each Week. Standard Service Package $79/month with Spa $100/mo. -Check and Balance Chemicals Weekly,- Maintenance performed on Same Day each Week. Full Service Packaqe $115/Month with Spa $150/mo. -Balance Chemicals Weekly,- Maintenance performed on Same Day each Week.